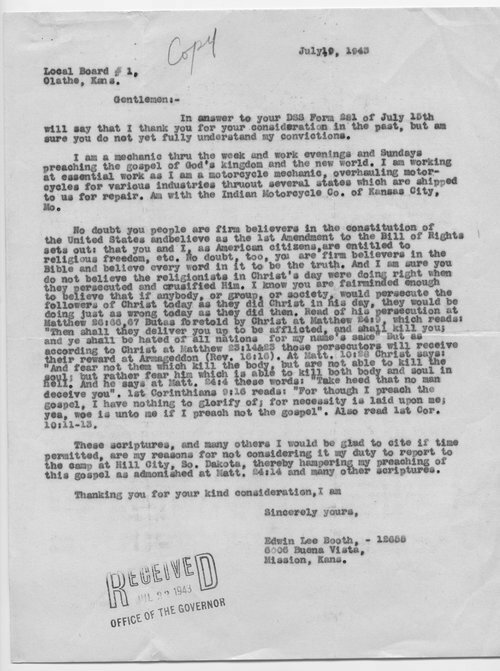 This letter from Edwin Lee Booth of Mission, Kansas, describes his reasons for not reporting to the Civilian Public Service (CPS) camp at Hill City, South Dakota. Booth, a motorcycle mechanic, argues that his duty as minister prohibits him from working for the U.S. government. The CPS camp at Hill City was built to help support the completion of the Deerfield Dam which was designed to provide water for Rapid City, South Dakota, as well as much of the surrounding countryside.